My name’s Phil and I’m the ISSC’s Chief of Race. I also own Impulse Racing, a specialist UK ski racing school, and I’m also the Programme Director of the National Schools Snowsport Association. I’m often asked how racers can improve their racing technique, but for me it’s important to remember that racing well is just high-level skiing. Therefore, it’s actually improving the technical, tactical and psychological aspects of this that will bring about improvements. At Impulse, we work on the old adage ‘build the skier, create the racer’. So, here are my five top tips to help you to build your skills within the gates! 1- Get your feet apart! Skiing with your feet glued together doesn’t look good, for starters. But it’s also detrimental to your technique. Having your feet apart helps to open up the joints in your lower body so that they move better. This allows your body to work with more biomechanical efficiency. Keep your hands within your peripheral vision. You don’t have to try to carve all the time! Work to stand strongly against the outside ski. 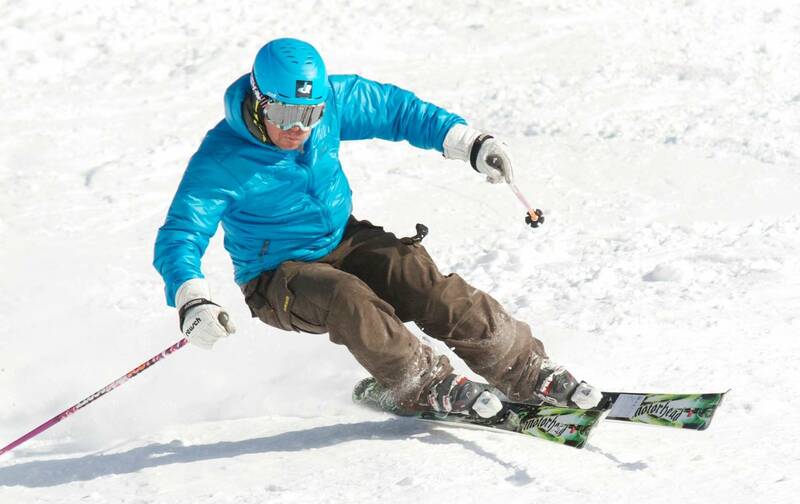 You may have heard from instructors that you need to stand or put weight on your downhill ski. While this is true, it’s only the case in one position. If you think of standing against the ski that is outermost in the turn, this starts as the uphill ski and then passes through to become the downhill ski. At this point, when you start the next turn, you want to ensure you stand against the ‘new’ outside ski. While carving can be efficient and often desirable within skiing, it’s not always the fastest or best way to ski some terrain or, indeed, all the gates on a race course. Being able to utilise steering or rotational skills is essential in adjusting line and speed. If you watch top racers you will see how they use steering to great effect. Don’t forget, you can choose to add training from Impulse to your package! Keeping your head level and your eye line horizontal is key to maintaining your balance and, potentially, avoiding collisions or accidents. Looking down at your feet or skis doesn’t actually help you, as your balance is affected by the movement of your head. You can be travelling with speed and it’s like looking immediately in front of your front wheel when riding your bike. This is tied to point 4 in that it will also help you to keep your balance, by stopping your hands from dropping. This is important because when hands drop it can drag you into a seating or ‘hanging back’ position. I hope you’ve found this information helpful – please feel free to share it with your students! Don’t forget, you can choose to add training from Impulse to your package – please don’t hesitate to contact us for further information. And please don’t hesitate to contact Phil at Impulse for training and selection in the UK prior to the ISSC – they also run indoor races that can be used as selection events for schools.